Private companies, public agencies reaping benefits by replacing fleets with electric vehicles. After years of working to educate the leaders of private companies and public agencies about the benefits of electric vehicles, Zach Henkin is seeing growing momentum in their acceptance as fleet vehicles. Henkin, deputy director of Forth Mobility, said the most notable increases are in fleets of passenger and light-duty vehicles as business owners and agency leaders learn that EVs today have greater travel range and are more assured that charging stations are readily available throughout the Portland metro area. "I think we're seeing a trend and interest in wanting to transition and actually put plans into place to move toward electrification. I first talked with one company about five years ago and now they are ready to consider an electric fleet," he said. "These weren't as seriously viable a couple of years ago, but now we see examples of thousands of miles that have been driven and we can get driver feedback." Uber and Lyft are a highly visible example of the increasing popularity of EVs as fleet vehicles for private companies. "Both companies have their own programs on how they are supporting moving their drivers into EVs, and it's good PR because while these cars may be adding to the traffic they aren't adding to the carbon," Henkin said. Transit buses and school buses are another growing area of electric fleet implementation, thanks to a broader variety of product models and incentives that are part of the Volkswagon environmental mitigation fund, or the VW Trust. As part of its settlement for using emission control defeat devices, VW had to put $2.9 billion into a trust fund that was distributed to each state across the country. Oregon's Department of Environmental Quality proposed using $18 million of the state's roughly $72.9 million cut to upgrade 450 older, diesel school buses. With an estimated 50,000 EVs anticipated to be on the road by 2020, utilities stand to gain and are stepping up to support charging projects. Pacific Power provides grant funding to help non-residential customers develop EV infrastructure projects such as workplace charging stations. "That can be very attractive to a company that is considering a fleet because that's another capital cost that they don't have to pay for," Henkin said. While electric passenger and light-duty fleet vehicles are gaining traction, the development of electric heavy-duty vehicles, pickup trucks and box vans such as U-Hauls is lagging behind. Henkin noted that electric pickup trucks, in particular, would be widely used. 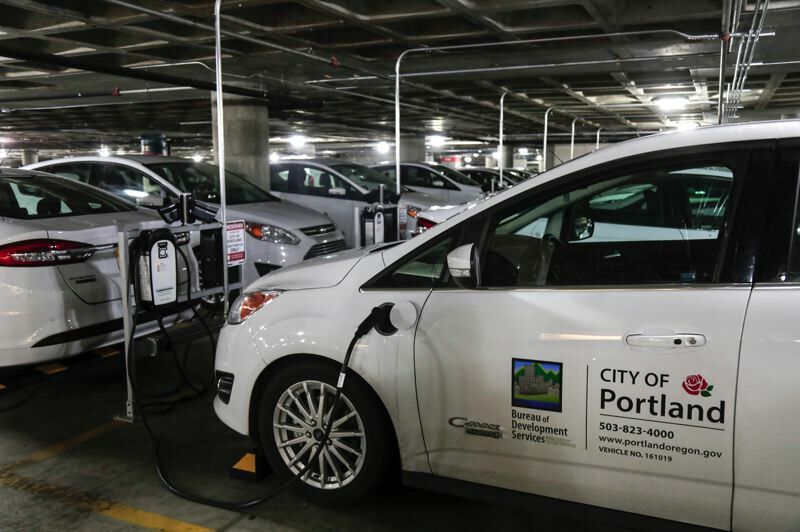 Public agencies such as TriMet and Portland's Bureau of Development Services (BDS) are reaping the benefits of implementing EVs into their fleets, and more than 20 percent of the city's fleet sedans are EVs and hybrid EVs. BDS was one of the first of the city's departments to switch out its fleet because its inspectors use only sedans rather than heavy trucks. As the department began exploring its EV options, Katie Salazar, facilities coordinator, heard loud and clear from staff that they did not want to drive a Prius and considered it "the ultimate green wimp car." The model also was uncomfortable for taller inspectors and staff found the sight lines to be difficult. "By including staff in the decision-making process," Salazar said, "they felt more ownership of the ultimate purchase." After testing several vehicles, BDS staff chose the Ford C-Max Energi plug-in hybrid. Now, all of its 108 vehicles are hybrids or plug-in hybrids, which are expected to save money over the vehicles' lifetime because hybrids need to be replaced every 10 years or so while gas- or diesel-powered cars need to be replaced every six or seven years. Hybrids have lower operation and maintenance costs, and the purchase price is lower than in the past. Since the EV fleet has been implemented, staff feedback is that the cars handle well and drivers appreciate that they are quieter than conventional vehicles. The EVs are now the first cars to be reserved, noted Ingrid Fish, EV policy lead with Portland's Bureau of Planning and Sustainability. In an effort to address the lack of EV options for medium- and heavy-duty vehicles such as delivery vans, garbage trucks and pavers, Portland partnered with Seattle, San Francisco and Los Angeles — all members of the Mayors National Climate Action Agenda — in submitting a request for information that invited automakers to share plans for meeting the cities' demand for EVs. The RFI noted that the four cities could buy or lease up to 24,000 EVs for their fleets if automobile and truck manufacturers were able to meet the demand at an affordable cost. For its part, TriMet has committed to replacing its diesel-powered buses with a clean energy fleet by or before 2040. The agency cited technology advances and bus manufacturers' efforts to improve electric battery power and travel range as factors that make the transition feasible now. It estimates it will take 20 to 24 years to complete the transition because it needs to spread out the cost of the conversion to make it financially achievable. 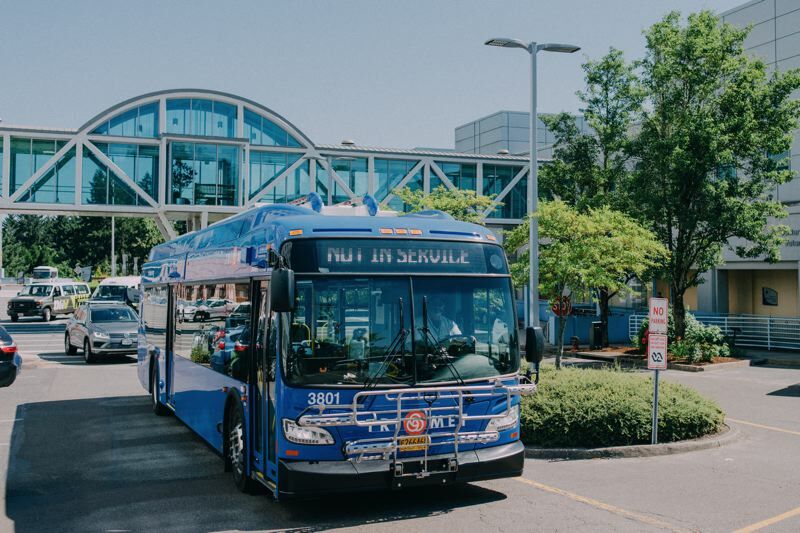 TriMet received two grants from the Federal Transit Administration's Low or No Emission Vehicle Program to buy 10 battery-electric buses and it expects five of them to be on the streets this year. The agency plans to use the next four years as a test by running the zero emission buses in predominately low-income and minority communities and evaluating their performance, cost and reliability. TriMet will dedicate $53 million from the payroll tax created by the Keep Oregon Moving Act to pay for another 70 electric buses over the next five years.